Can anyone suggest resources for me to check out when I one day want to build a brick walled garden as a way to play around with learning bricklaying? In other words, what do I need to learn before I make some mistakes in person when attempting to lay brick walls in cold rocky New England? Check the various bricks available in your area to find your choice. Then there`s no better mean`s of learning than practice,make a 3 to 1 mix of sand and lime for practice use,this mortar can be knocked up again/mixed up again for another practice and easy to clean bricks off. Get to know the trowel and the wrist action,practice to lay beds,when your ready to lay your first brick its time for you to use the spirit level,get your first brick right and the rest follows in order. Before starting to brick the wall make sureyour foundation is level,or compensate by bedding up,set out your first course and then build up the quoins,then your ready to use quoins blocks on your line for filling in the panel. Wait till your frost has gone. all a i can add is if it is a garden project it is worth establishing the acidity/mineralisation of the soil and ground water before selecting a mortar recipe. whatever the local contractors use is probably ok .
if there is a fair bit of thermal variation ie the eastern usa i might be inclined to use a 4 sand 1 cement 1 lime ( steep it for a while , see google etc ) . if you have an acid soil or high levels of some inorganics there are cements and additives that help mitigate the issues. I would agree with Ty for practise; as he says, the mortar can be scraped off easily and reused. Once you get it right, go with a more stable mix, although there is a lot to be said for lime mortar as it allows movement. 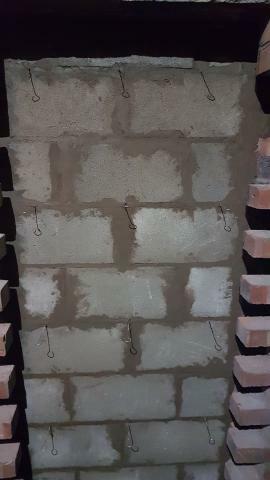 The normal way of making sure you have a level wall is to put a line in it; you can get spiked ends to put into the mortar course, and use a straight edge or plumb bob to make sure you are right vertically. 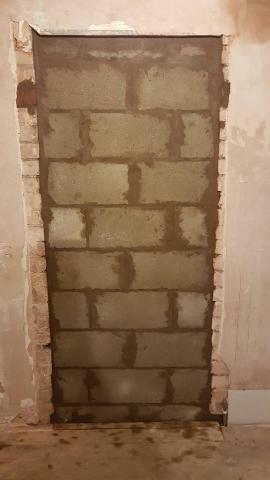 I am not a bricklayer, but husband did a course a few years ago, and has done some odd bricking jobs where needed at home. So I made a start this weekend. I got the inside done on Saturday and then I started on the outside on Sunday. I'm fairly pleased with it so far. they match fairly well and it looks ok. I've read and reread everyone's advise on here and then gone really steady away when doing it. I have to say it was a bit fresh sat out there yesterday and the wind blew down the side of the house. The brick matching guy did a great job off just a photo. 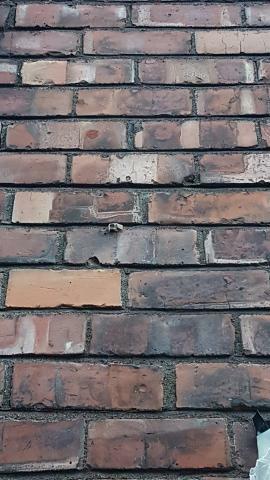 Can you take a photo of the upper part of the outside up to where you removed the cracked lintel porch,looking at the brickwork you have done and the brickwork above lintel on page 2,something is different in the brickwork,the bond has changed,or these new bricks are shorter. If you drop a plumb line down from a few course above one should be able to see what the difference is,if you look at the brickwork above the courses are uninterrupted right across the opening. Thanks DD, I'll see if I can squeeze you in next year. Ty, once I make it up there and get the lintel removed I'll do some photos for you. I know what you mean about the brickwork, I thought it would be a straight run across but it's not and I'm having to put half bricks in. It's left me confused. You haven't removed the lintel yet,follow the brickwork above the lintel either side of the doorway,then follow them bricks downwards,you will see what`s happened then. What width was the door?must be a narrow one. Thanks Ty I'll give that a go and see what I get. The door was just a normal size door, I thought. To fill the gap in on the inside took just under two lengths of the concrete blocks which were 440 mm in long. 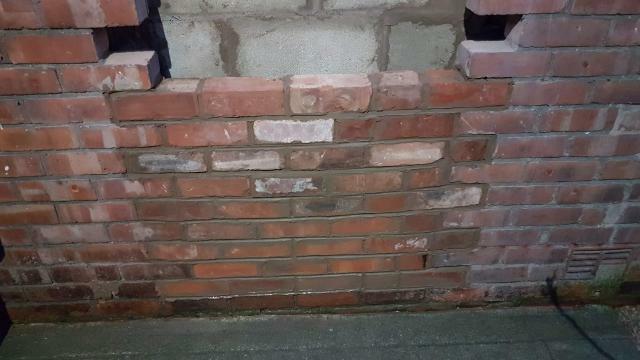 That`s what I`m confused about,normally it takes 2 blocks like yours and 4 bricks to fill a gap of 36ins. What is the width of the outside opening? 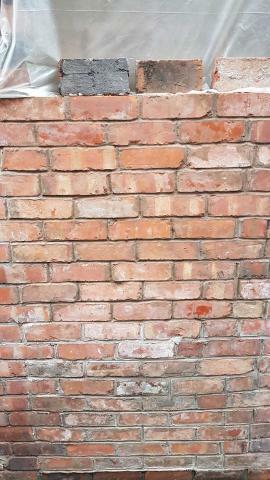 Measure length of bricks in the wall either side and the new ones you`ve got,there is something strange going on there. I'll get that sorted and report back. On an aside, the bricks at the bottom of the door that I took out were from Accrington which is about 40 miles away from where we are. Ty, I've not dropped a plumb line yet but you can see from the picture below how I think it's just the brick laying that's a bit rubbish. All along the gable end there is no symmetry. This is my door blocking so far. Hoping to get the strongboys in this weekend and get finished before Christmas day.